The process of tiny tadpoles growing strong and then slowly changing from aquatic fishlike creatures to jumping, googly-eyed frogs is a miracle of nature. If youngsters (or the young at heart) have a chance to witness this transformation, they should do so, of course in the most responsible ways possible. 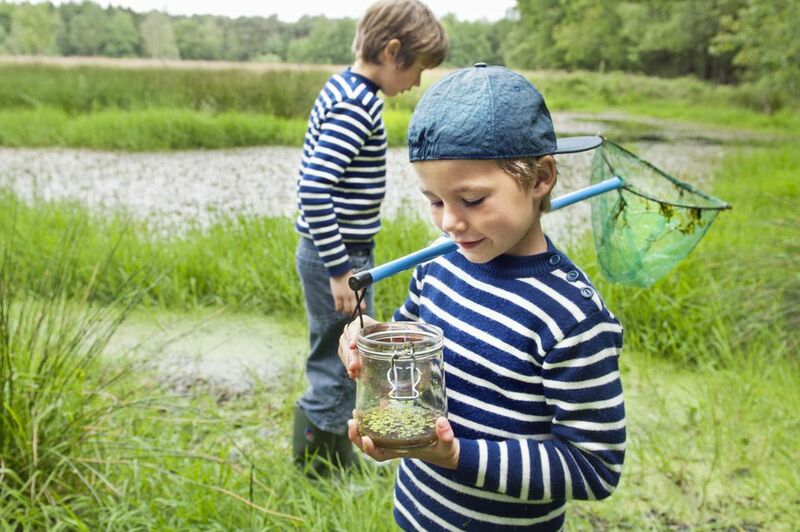 Collecting tadpoles or eggs is illegal in many places, so be sure to check with your government wildlife or environmental agency before doing so. If it is legal where you live and you decide to collect eggs or tadpoles, make sure to just take a few and leave the rest. This will reduce the impact on the environment. Plus, growing tadpoles take a lot of space and work, and you don't want to get in over your head. You may be able to ​release frogs raised from eggs or tadpoles harvested from the wild, but you should check with your wildlife department about this as well. Of course, if the frogs turn out to be a non-native or invasive species, do not release them. You should be prepared to keep the adult frogs in the event that you cannot release your tadpoles. Frog eggs are laid in gelatinous clumps and are clear with black dots in the center. They can often be found at the edge of ponds just under the water, especially in areas with algae. Another option is to obtain captive-bred eggs or tadpoles. This is a good way to find out what species of frog you are raising. You will have to be willing to house the adults since they will most likely be non-native species. And, if you are breeding captive frogs, you may want to limit the number of eggs you hatch and raise as well, or you may find yourself with an overpopulation problem. Since you should never release captive bred or non-native species, you should only raise as many as you can re-home or reasonably care for yourself. You will need a good sized container for your tadpoles, such as a garden pond, child's swimming pool, or an aquarium or plastic container. Ideally, you can keep them outdoors as this will better mimic natural conditions and they will get the sunlight they need, but the container must be partially shaded. Tadpoles tend to prefer shallow water. Rocks or smooth gravel can be placed at the bottom of the pool, and as the frogs mature, they'll need a way to get out of the water, such as a partially submerged rock, a piece of wood, or a gravel slope that leads to land. Safe aquatic plants, which will help with oxygenation of the water and provide a place to hide and some food if algae grow on the plants, should be included in the pool as well. Leafy underwater plants are better at adding oxygen than surface-covering plants. Use only dechlorinated fresh water. To remove the chlorine from tap water, let it sit for at least 24 hours before putting it in your tadpole's pool to let all the chlorine dissipate, or treat it with dechlorination drops for aquariums. Tadpoles are extremely sensitive to the presence of chlorine and heavy metals. In smaller containers and aquariums, the water will need frequent partial changes in order to maintain good quality. Scoop out about a third of the water and replace it with clean dechlorinated water. Remember that the tadpoles should not be handled during the water change, or any other time, as their skin is very sensitive to the natural oils and traces of soap or chemicals on our hands. Always rinse your hands very well before doing any tank maintenance, feeding, or other tasks. A tadpole's diet varies between species, but most are herbivores. Frozen and thawed leafy lettuce such as romaine or spinach is a good staple. Some people recommend boiling it, but this can cause loss of nutrients and once it has been frozen it is usually soft enough to feed. Good quality flake fish food and crushed algae tablets (available at aquarium shops) can be offered as well, and you may even be able to find tadpole food at pond shops. Feed small amounts a couple of times a day. Excess feeding will create water-quality problems. Use a small fish net to scoop out uneaten food. If possible, try to find information on the tadpole feeding habits of the species you are raising to make sure you are feeding them adequately. Do you know the species? The time it takes tadpoles to undergo metamorphosis to the adult stage can vary. Usually, metamorphosis takes a few weeks to a few months but a few frog species, such as some bullfrogs, remain in the tadpole stage for up to 2 years. This is a good reason to know what species of frog eggs or tadpoles you have. The process of metamorphosis is complex and it is a stressful time in a frog's life, especially near the end of the process. Externally, it starts with the development of the back legs followed by the formation of the front legs. The frog's body shape changes as well. Many other changes, such as the development of lungs, the loss of gills, digestive tract changes to accommodate the change from a herbivorous to a carnivorous diet, and transformation of the skin, occur as well. Toward the end of metamorphosis, the tail of the tadpole is reabsorbed. Tadpoles may eat less during the last stages of metamorphosis, particularly during the phase when the tail is reabsorbed. As metamorphosis progresses, it is vitally important that the developing frog can easily get out of the water. You can use partially submerged, but stable sticks and rocks to make ramps out of the water; it's also advisable to make a gravel slope out of the water to a land area. Lower the water level in the container, too. Once the gills stop functioning and the lungs take over, it is possible for tadpoles to drown if they cannot get onto land. Some specialized ground species may need to be removed from the water altogether once their tails start to shrink since they are not programmed to leave the water and may simply drown. Feed the newly developed baby frog small crickets, fruit flies, bloodworms, and other small insect and invertebrate foods, and if you have clearance to release native frogs, then release them as soon as possible after metamorphosis. Do so as close to where you found them as possible. This gives the young frog the best chance to adapt to life as a wild amphibian.